Description. The Theatre Arts Minor is structured to give students an overview of drama and theatre, in terms of history, performance, and criticism. The curriculum involves the student in both the practical and theoretical aspects of the theatre process. 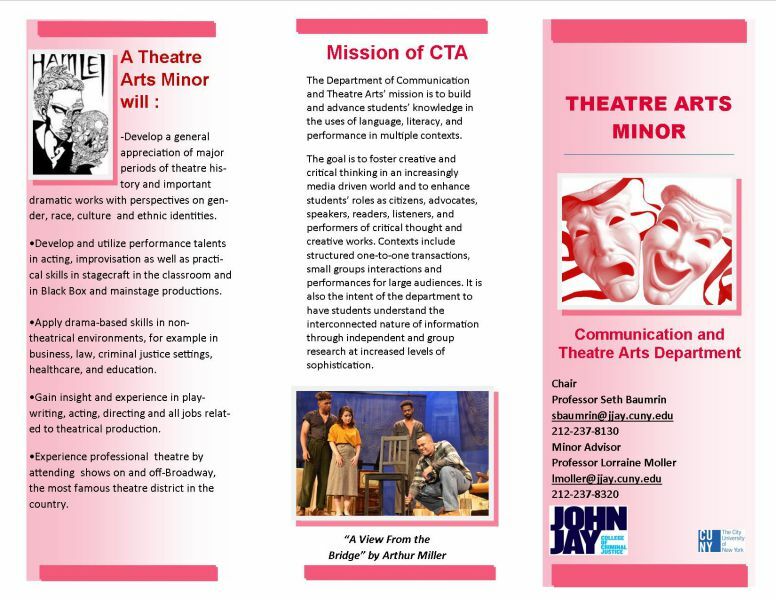 The minor offers ample opportunities for students to apply their skills onstage and/or backstage. In addition, the Theatre Arts minor affords opportunities to enhance creativity, time management, and communication skills that are useful in virtually any professional area. John Jay College’s proximity to Lincoln Center and New York City’s theatrical district provides students with opportunity for utilization of performing arts libraries, organizations, theatres, and internships. The Theatre Arts minor concludes with a 3-credit 300-level theatre course or Capstone Project chosen by the student, under the guidance of a member of the theatre faculty. This project will provide the student with the opportunity to demonstrate acquired proficiency in an area of performance, production, criticism, and/or scholarship. •Know what is meant by Theatre, in particular what distinguishes it from drama and film. •Develop a general understanding and appreciation of major periods of theatre history and major pieces of dramatic literature with perspectives in western and non-western traditions and gender and ethnic identities. •Identify the characteristics of the major theatre genres, and know how each of these genres and styles have engendered distinctive forms of playwriting, acting, directing, and theatrical design. •Enhance critical thinking and writing skills through literary analysis of important dramatic works of classical and contemporary drama. •Acquire the ability to analyze scripts and critically assess those elements that contribute the theatre process. •Apply drama-based skills in non-theatrical environments, for example business, law, criminal justice settings, healthcare, and education. •Acquire cultural capital through exposure to professional theatre in the New York City area. 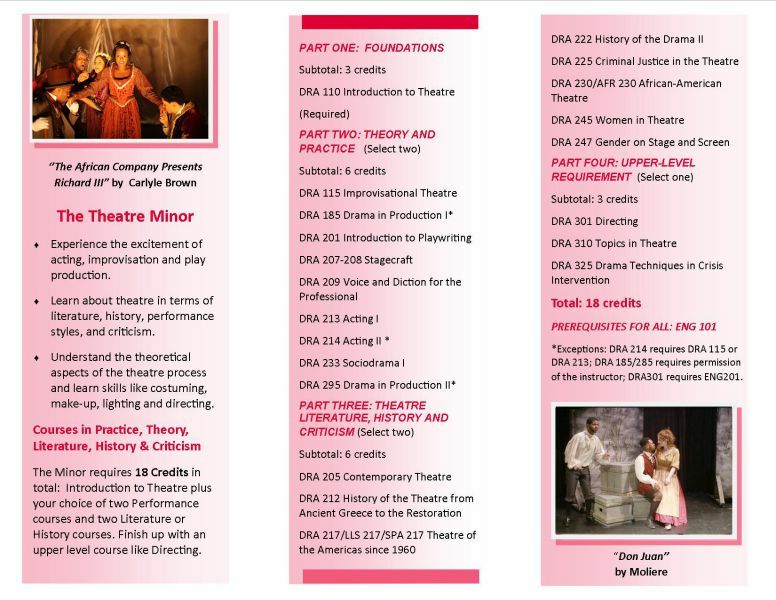 The Minor requires 18 Credits in total: Introduction to Theatre plus your choice of two Performance courses and two Literature or History courses. Finish up with an upper level course like Directing. *Exceptions: DRA 214 requires DRA 115 or DRA 213; DRA 185/285 requires permission of the instructor; DRA301 requires ENG201.